Afterwards, Quigley rode the motorway. He sped backwards, towards a childhood memory, a raft riding Waitomo's darkness. 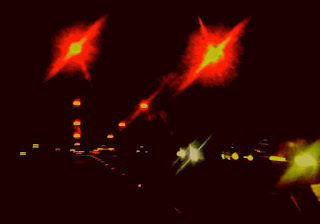 Streetlamps & taillights burned like worms. Tar was cavewater. Quigley accelerated. This time he would wreck the raft, this time the blackness would imbibe him. Imbibe is a good word!